"Any of us who have raised children know, as John F. Kennedy once said, that "to have children is to give hostages to fate." To lose a child to an illness, or even an accident can be dealt with during the passage of time. To lose a child to a predator, an insanely brilliant killer, is almost more than any human should have to bear." Ann Rule, who lives in Seattle, Washington, is the mother of five children: two daughters and three sons who are now in their 20s and 30s. A graduate of the University of Washington's Creative Writing Program, Ann has minors in psychology, criminology, and penology. Her early jobs included being a caseworker for the Washington State Department of Public Assistance and a police officer. She continues to lecture frequently at forensic conferences, assist with detective work, and publish articles on law enforcement issues. She became a full-time crime writer in 1970, and now writes, on average, a book every eight or nine months. On her resume are eighteen books, seventeen of which became New York Times best sellers in her specialty genre of true crime. She also authored one travel book, and a novel. The 20-year anniversary issue of The Stranger Beside Me, (W.W.Norton, 1980) about serial killer Ted Bundy, whom she knew personally, was recently released. In the book, Rule describes her 20-year friendship with Bundy, whom she knew as a kind soul who staffed the late shift with her at a Seattle crisis clinic. She confided in Bundy, and at the time it never ocurred to her that the "Ted" the police were searching for was the man who sat next to her every night, fielding calls from desperate souls. The New York Times called The Stranger Beside Me: "As dramatic and chilling as a bedroom window shattering at midnight." Ms. Rule is also winner of Peabody Award for her miniseries Small Sacrifices, (New American Library, 1989), two Anthony awards from Boucheron, and the Washington State Governor's Award. Her book Small Sacrifices is an account of the destructive forces that drove Diane Downs, a beautiful young mother, to shoot her three young children in cold blood, which The New York Times Book Review referred to as, "Vivid....Extraordinary...a page-turner." Kirkus called the book "A harrowing pathological portrait....A work of resonance and revelation with breath-stopping tension to the end." And a reader wrote: "This books shows the evil that can reside in a human being enough to kill/ injure their own children. Ann Rule delves into these lives like no one else can do. I can feel the heartbreak of the surviving children. If a true crime buff has not read this book, you must do so immediately." "Writing is the same as stacking grains of sand on an ant hill. Make the most of the time you have to write, even if it's only an hour a day. Never think of a whole book -- concentrate on 10 pages at a time. And don't put it off! " My early inspiration to discover "why" people turned out the way they did came as a child when I spent summers with my grandparents, and helped prepare meals for prisoners. The men and women I met then had committed serious crimes, and yet they seemed perfectly normal. This led to my first questions about human behavior. The actual switch from a career of fighting crime on the streets to writing about crime came due to a physical limitation. I'm very nearsighted, and couldn't pass the police exam, which at that time required 20/20 vision without correction. I worked in the Department of Welfare, and then got married, and had four kids (my 5th child is a foster child). When it became apparent my marriage was coming to an end, I thought I would go back to writing. That led to five years of rejection slips. After five years, I sold one article for $35 and was thrilled. The next year I sold three articles, and in the third year I sold a thousand dollars worth. From that point, I was off and running, and could support my children through writing, although sometimes it was tight. I wrote fourteen hundred articles for True Confessions, True Detective (where I was asked to adopt the male penname of Andy Stacks because they didn't believe a woman could know so much about crime) and other detective magazines. I also wrote a mystery novel which I couldn't sell. My first published book was The Stranger Beside Me, released originally in August 1980. I had written a proposal titled The Astrology Murders describing what was then the unsolved murders of several young women in the Seattle area. I got a contract from W.W. Norton in three days. Six months later, I got a call from Ted Bundy telling me he was in a bit of trouble. Never in my wildest dreams could I have dreamed up a plot for a novel where a woman who is writing a crime story ends up knowing the murderer. Stranger Beside Me did okay but not great in its original release. They told me it was a book with "legs," meaning it would stand for a long time. It's now in its 40th printing. Possession, (Pocket Books, 1997), my novel, was inspired by the Stockholm syndrome case I later wrote about as nonfiction in Empty Promises, (Pocketbooks, 2000). I originally fictionalized the story to avoid embarrassment to the young woman involved. The novel sold quite well and was #1 in the Los Angeles area but not nationwide. Someday I'll write a sequel. Next I wrote a trilogy of books on serial killers (The I-5Killer, The Want Ad Killer, and The Lust Killer, New American Library, 1999) under my male pen Andy Stacks. They didn't do that well until I put my name on them and then they started selling. My big break came with Small Sacrifices in 1988. In 1984, I went to the Diana Downs trial at the invitation of a police contact. I had just come off a book tour for Possession, so I had time to sit through her trial, and that was my breakthrough. The book came out in hard cover in 1987, but then was sold in paperback, which changed my whole life because it was a huge bestseller. It is the book women most often tell me they like. So, it took me 18 years of writing to reach this point. They were 2, 5, 7, and 9 years old. I wrote in our basement, which used to be a garage; it was our rec room too. The kids would be fighting and watching TV while I wrote. The only time I couldn't write was when they fought on top of the typewriter. It took years before they connected my typing to their eating-they didn't realize it was my job! I used to say I was a mother first, then a writer. I wrote so I could be at home with my children and have the flexibility to take care of them when they were sick or needed me. Now that they are grown, I say I'm a writer, then a mother. Being a mother makes a big difference in my writing. When my girls were teenagers, it was really difficult to write about victims in that age bracket. Now that they're grown, I'm doing a lot of work about battered women, which has occurred almost subliminally. My last three books have been about men who batter their wives and kill them. I feel I am the only voice of victims. People ask me if I have any answers about what makes a criminal. I believe you can't change those whose lives are already set in cement, but we can certainly take care of children, and try to prevent them from being treated badly. Yes, it made my girls especially uncomfortable. They thought I was warped. One of my daughters got jumped by a guy who tried to strangle her just because she was my daughter. She remembered what I had told her about scream, kick, and run, and it saved her life. She stopped thinking I was warped after that. I always allowed them to read my books. One time my son Michael had to do a book report for sociology class, so he asked me to tell him about one of my books. I gave him Stranger Beside Me, and told him to read it. He disappeared into his room for a few days, only came out for meals, and when he was finished told me I "wasn't a bad writer." My boys also used my writing to pick up girls -- they would offer to get my autograph on a book. My father was a coach and my mom a teacher of developmentally disabled students. She read to us from before the time we could really comprehend-all sorts of literature. I learned to love the written word because reading and writing were always a part of my life. My parents also taught me I could do anything. I grew up and found out there were some things I couldn't do, but I had confidence. For awhile, when she was living with me, my mom would read aloud what I had written at the end of each day. She was very supportive, and it was a big help to hear how my writing sounded. My dad read articles I wrote for Cosmopolitan and Redbook and other magazines, but he died before The Stranger Beside Me was published. My daughter Leslie is a writer, which is no surprise since her dad wrote, so she grew up watching both of us write. She now has two fictional mysteries, a travel book, a book to be released in the fall about ghosts. All of my kids write in one way or another. Has there ever been something from your or another child's life you wanted to write about but didn't for privacy reasons? Lots of them. I won't write really grisly stories, or about cults, drugs, motorcycle gangs, or organized crime. There are also two books I started but didn't complete. One was about a young female bank executive who was murdered. Her family was still so upset, I stopped writing the book. Another book I didn't finish was about two roving serial killers. The details of their murders were so bad I didn't want the families to know, so I gave it up. It seems to me I may bring something to the field of crime writing that men do not. Women are often much better at understanding emotions, and wanting to understand emotions. When you're a mother, you have that many more feelings about what causes children to grow up in certain ways. Every Breath You Take, the story of a mother of quadruplets who was murdered in Florida. I write every day from 10 AM to 7 PM after walking 2-3 miles. I spend 4-5 solid months on research before I even begin writing. I write seven days a week, but I'm hoping to start taking weekends off. Any advice for beginning writers? Writing is the same as stacking grains of sand on an ant hill. Make the most of the time you have to write, even if it's only an hour a day. Never think of a whole book -- concentrate on 10 pages at a time. And don't put it off! My mom always said, "Someday when you kids are grown I will write." She never did. Years ago, when I was writing for True Confessions, I was on a panel and someone told me, "Old Ann Rule, you're going to make it because you don't give up." Writers conferences always tell you how few make it, but I knew he was right. I was going to persist until I was among the ones who do make it. 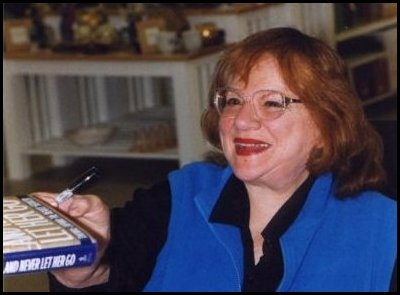 You can find out more about Ann Rule on her website. Ms. Rule has put together six pages of tips on writing, publishing, and finding an agent using lessons she learned the hard way. This information is available through P.O. Box 98846, Seattle, WA 98198. Include a legal sized self-addressed stamped envelope with two stamps.